S&S® Super Stock® band style cylinder heads for 1979-'84 HD® big twins feature a stock like appearance, but flow much better than stock heads. Heads come assembled with premium valves and S&S® valve springs that can handle cams with lifts up to .590". These heads are machined for one spark plug per head and accept 3-5/8" bore cylinders. These cylinder heads are original equipment on S&S® SH-Series engines, and are a great upgrade for stock shovelheads. Rocker boxes are fastened with 5/16"-18 cap screws instead of the stock studs and nuts. 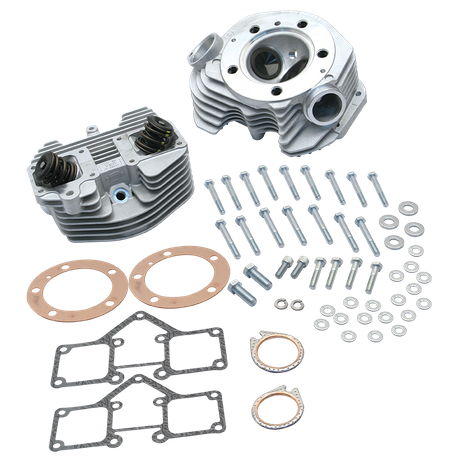 KIt includes front and rear cylinder head assemblies, rocker box gaskets, copper head gaskets, exhaust gaskets, hardware, and instructions. Natural aluminum finish.